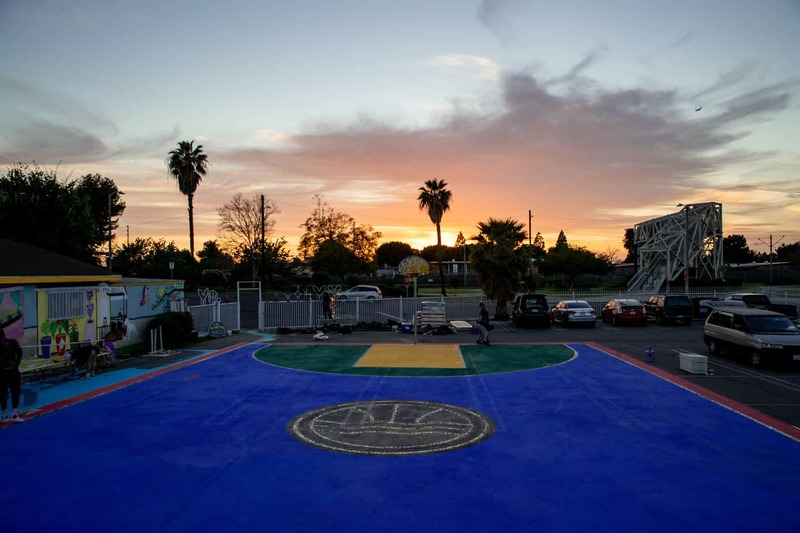 On Saturday, March 23, 2019, Veniceball brought its creative style to Watts, California, as they inaugurated a brand-new, customized basketball court known as the “Watts Oasis”. Watts Oasis was built directly beside St. Johns Church and about a block away from the renowned Watts Towers. inspiration from the Towers, the court features a mosaic tile encrusted out-of-bounds, tile-inlaid three-point and free throw lines, as well as bright bold blue, yellow, and red paint on the court. Accompanying the court is a community garden which was donated from Community Healing Gardens in Venice. The court was powered by Crep Protect, a sneaker care brand who served as the main sponsor for the entire project. The finishing touches around the venue — such as the mural that accompanied the court and the reimagined fence — were brought to the project by muralist Robert Miller and Lori Powers, a part-time artist and starting point guard for the USA Senior Women’s basketball team. I had the luxury of volunteering during the project and was there when the court was completed. At that moment, you could sense the impact it would have. The project may have been coming to an end, but a renewed sense of community pride was just beginning. Fast forward to the ribbon-cutting ceremony where the lead developer, Augustine Aguirre, officially opened the court to the public and the main staff behind the project were all presented with certificates from the city after Congresswoman Nanette Barragan made a special appearance where she acknowledged and thanked the organization for its work before the all-star game kick-off. The celebration was supported by tremendous vendors like Bristol Studios, which had a DIY T-shirt making station, Everytable, a local eatery that serves healthy and affordable scratch-made meals, and Eatgud, which provided healthy smoothies and sandwiches. Sounds were provided by Soulections very own, Andre Power. As amazing as the atmosphere was at the Watts Oasis, things became even more extraordinary when the basketball began. The celebrity game was true to Veniceball’s form. UConn’s Quinn Williams dazzled the crowd — and unfortunately Pastor Larry — with his incredible leaping ability. Battle rapper and Watts native, Daylyt, put up the best numbers with his, surprisingly, consistently high level of play. Chaz Smith demonstrated why his basketball ability might be on par with his comedic skills. And high-flying Chris Staples did what he does best and dunked all over the competition as the VBL All-Stars joined the festivities. The basketball beauty league all-stars also joined the party and provided some scintillating action. All in all, Veniceball helped create a one-of-a-kind experience that was vastly more than just the sum of its parts. The value of a community center supported by a court such as the Watts Oasis cannot be understated and as the son of a Haitian immigrant, I know the first generational plight and challenges facing many in the area. It serves as a place for local youth to receive support and escape life’s day-to-day jeopardies, an understanding that led to an uncontrollable.